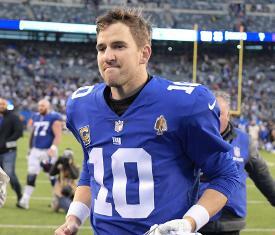 Eli Manning's agent, Tom Condon, expects his client to be back with the New York Giants for a 16th season in 2019. "Shoot, yeah, I think so," Condon told the New York Post on Monday evening from the Senior Bowl in Mobile, Ala.
"I think he'd love to come back," Condon added. "Guys love to play their whole careers with one team, if they have a good experience with that team." The Giants are expected to pursue a long-term answer at quarterback this offseason, but that doesn't necessarily mean Manning, who turned 38 earlier this month, won't return. The team is believed to want a veteran quarterback who can help bridge the gap to a rookie. Manning is on the books for an unguaranteed $17 million for 2019, and he is set to cost $23.2 million against the cap. The Giants would save $17 million against the cap -- with a $6.2 million dead-money charge -- by releasing him, but they could potentially pursue a restructured contract. "It's just too early," Condon said about the possibility of a restructure, adding the team hasn't approached him about the subject. Asked if he expects the Giants to do so at some point, he replied, "I have no idea." General manager Dave Gettleman said at his end-of-season press conference that all options were on the table, adding that he and Manning had an "extensive, no-holds-barred" conversation about the quarterback's situation. After the Giants were officially eliminated from playoff contention in Week 15, head coach Pat Shurmur said the team isn't in a hurry to move on from Manning, whom he still believes has "years" left as an NFL starter. Asked if he wants Manning back on the roster in 2019, Shurmur replied, "Yeah. I want all our players to be back. I believe experience matters." Manning finished the season with 4,299 yards, 21 touchdowns, 11 interceptions and completed a career-best 66 percent of his passes, though the Giants finished 5-11.